This is not really a technique, but a fun and easy theme album idea. 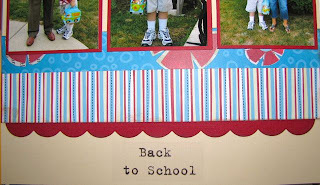 I had taken a class at Archiver's that got me started, then I expanded the theme to work for me. Every year for their birthdays, I have professional pictures taken of my boys. Every year they have school pictures taken. 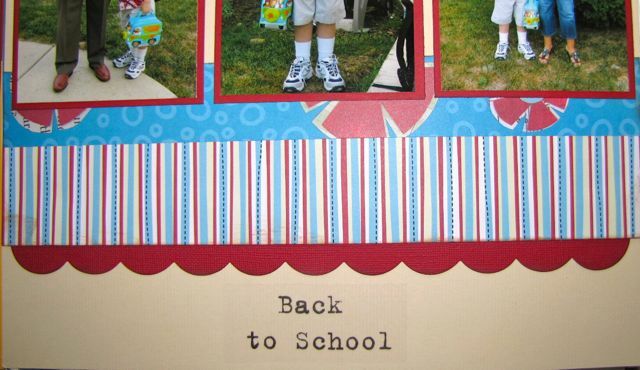 Every year, there is a first day of school. Why not put all these pictures in the same place? First, I keep it simple. 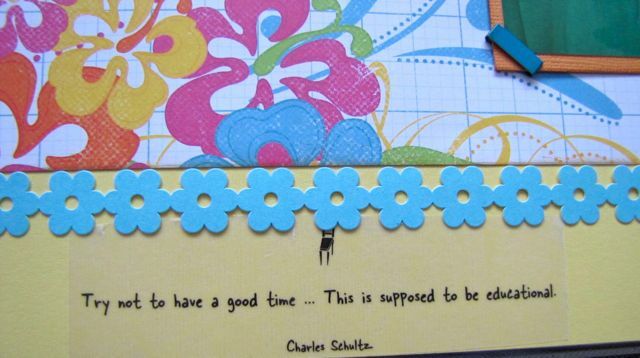 The only supplies I use are CS, 2PP a border strip, stickers letters or chipboard letters, and the occasional embellishment. That's it. Every layout is a 2 page layout. 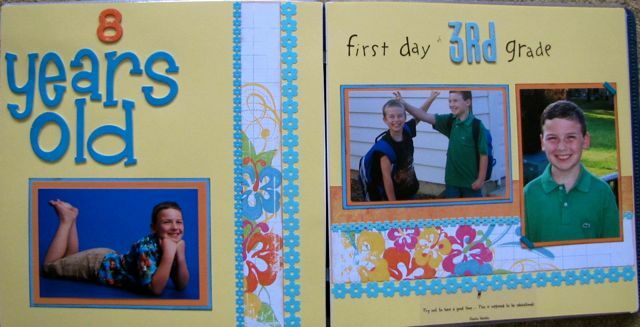 Same supplies on both pages. One page has one PP 1 1/2" wide, the other has 2 PP. The bottom one is 2" wide, the top one is 1 1/2" wide. I don't even line them up to match. 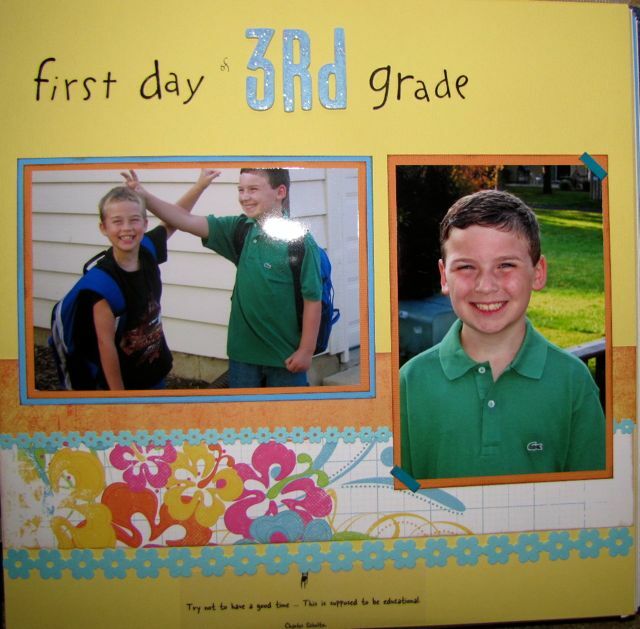 Some years I have more first day of school pictures that require a 2 page layout. Some years there are only enough for one page. I've still been able to arrange the pages, so they line up by year. I begin with the birthday picture because it come first for us. I try to pull colors from the shirt as best as I can. I always mat the picture so it stands out more. The PP is 1 1/2" wide. It's companion page is the fist day of school because it comes next. 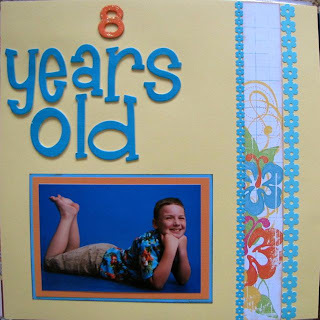 I only had a few pictures, so it was only one page, and worked nicely with the birthday picture. Notice the addition of the second PP which is 2"wide. Here is the 2 page spread. Next is the school picture layout. I use both the picture and the class picture. This is the original design from the class at Archiver's. In both this layout and the previous layout, I changed the orientation of the left page from horizontal to vertical. Lastly, here is a layout of both pages horizontal. 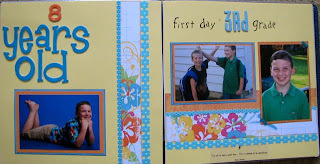 I had more pictures of the first day of school this year, so it became a 2 page spread. 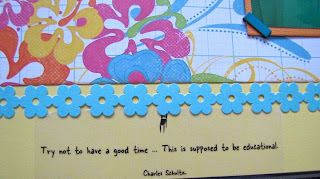 another quote sticker added to the bottom, and 2 PP on the left side page. I like having this album. It's easy to keep up. It's current and shows their changes and growth. I usually work on it right after I receive the school pictures, then I put it away until the next year. 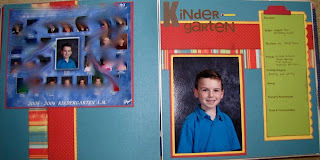 My older son likes to keep the class picture in his room until the new one arrives, so I leave a place for it in the album. I hope I've given you an idea to use. If not for school pictures, for something else. Devra, this is a great idea. 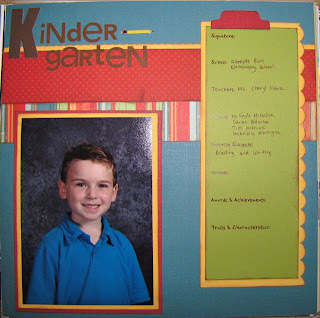 I may try to do this for ODS if I can find all of his school pictures. I found a link to your page from the CK forum site. Love it! So simple and perfect. I am definitely going to use this idea. I found a link to this page from the CK forum. Love this idea! So simple and perfect!